Modern, beautiful, tasteful and very practical  this is how you can describe this accommodation without any hesitation. 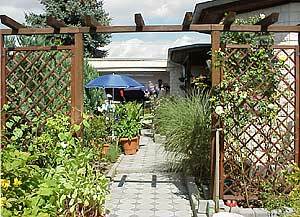 It is situated in the north of Leipzig, in a neighbourhood of detached houses near the new convention centre. 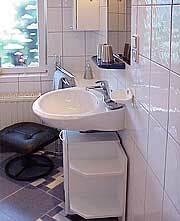 The apartment comes with its own bathroom and a cleverly concealed mini-kitchen. 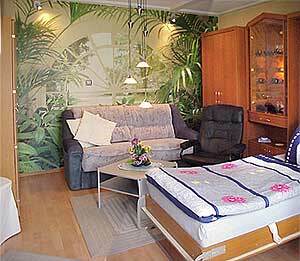 The bed can be folded away into the wardrobe. Here you will definitely feel well! Right behind the Pergula is the entrance to your apartment. At the left in the picture is the corner seating. The apartment lies in the extension to the home of the host family and has a separate access door. Originally built for private use, it is now available to you. Even though it measures only 28 m² (301 sqft. ), you will not miss anything. You have your own modern bathroom with shower and window. There is space for 1-2 people. For single occupation the fold-away bed shown above in the picture can be used, for double occupation there is the convertible studio couch.. The small mini kitchen with cooker, fridge and sink, coffee machine and tableware is hidden in the left cabinet (see picture right).. 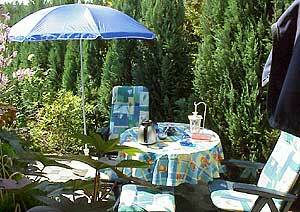 There is a TV and a radio set, a small corner seating unit from where you can look out into the garden. Everything has been thought of..
At the entrance of your apartment there is a protected seating area with chairs, a sun shade and a Hollywood swing  a nice place to be when the weather is fine, without being observed by the neighbours. You may sit there, perhaps with your hosts, for a little chat, for reading your book or to finish off the evening with a glass of wine or beer. Smoking is allowed in the apartment and the guests room. It is not possible to bring your pets. No parking lot problems. They can park the car free of charge in front of the house. To station Rosenowstrasse (bus) you walk approx. 600 m.
More information about the public transport in Leipzig you can find here: http://www.lvb.de . Important: In the tram you can only pay with money card. So it is better to buy the ticket in advance! 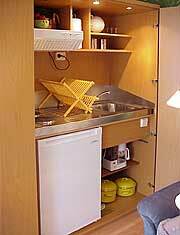 Breakfast is not offered, but you can prepare your own in the small kitchen. There is a bakery about 300 yards away. 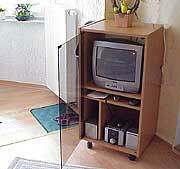 The apartment is located on Gogolstrasse in 04357 Leipzig, Saxony, Germany. Click on the map or link to get to a citymap - service www.stadtplandienst.de. or use the route-planer of web.de. This apartment in Leipzig is made available by Privatzimmer Sens, Agency for holiday apartments and guest rooms in Germany.